The septic system that you have on your property will have to be pumped out on a regular schedule. However, you also need to know that there will come a time down the road where the system will need to be replaced. Once it goes through many years of wear and tear, even the best septic systems will wear out. These are some of the top signs that you need to look for that will tell you it is time to talk with someone who can replace septic system in Granite Falls. When you find that your septic system is constantly backing up, there could be a chance that it is failing. If there is raw sewage that backs up into your toilet, this could be an indication of a major problem. Foul odors and pipes that gurgle are both signs of clogged pipes, and you may even notice that there is decreased toilet flushing or improper draining in your sinks, showers, and tubs. If you start to notice puddling over the drain field on your property or near the area where your septic tank is, you may have a system that is failing. Such puddles can be a major sign of system failure as it is not able to dispose of all of the water in a proper fashion. If the system is struggling in this manner, you will need to think about a replacement. The next time that you have your water tested, if there are elements in there such as bacteria, nitrates or contaminants, it may be a sign that there is a serious issue lurking. Water contamination is a good indication that your septic system is failing to dispose of the wastewater and it is not being filtered out correctly. While every homeowner wants to have a beautiful green lawn, if you notice that there are spots around your septic system that are greener than the others, there could be a problem that needs to be addressed. When there is a septic system failure, the moisture in the soil increases and this can lead to greener grass. If you are thinking that there could be a problem with your septic system, you need to call the experts for an inspection. This professional will look at the function of the entire system and make a determination as to whether or not a repair or replacement will be your best option. Should you learn that your septic system needs replacing, you can count on us at Schleg Valley Construction. We proudly serve a variety of commercial and residential customers in and around the Granite Falls area and we have the experience, manpower, and equipment to get the job done right the first time. 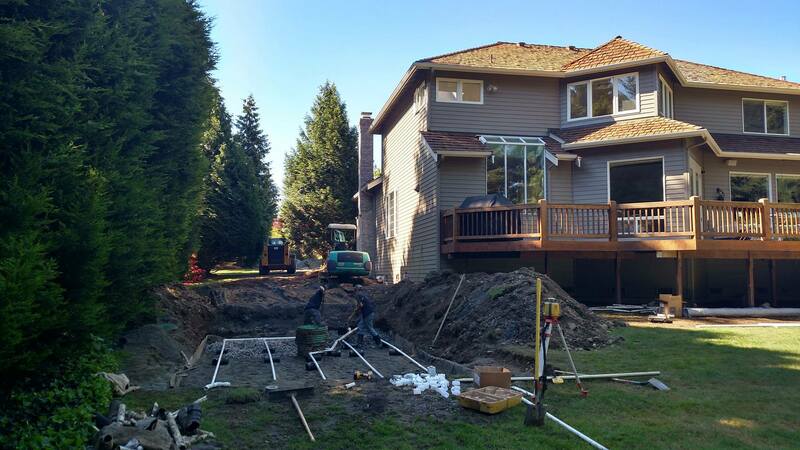 When you find out that it is time to call someone to replace septic system in Granite Falls, you need to work with the best. Contact Schleg Valley Construction today at (425) 312-6750 and we can set up a time to come out to your location for an inspection. Previous PostPrevious What Does It Take To Repair Septic System In Smokey Point?